This is a list of rivers of Australia. Rivers are ordered alphabetically, by state. The same river may be found in more than one state as many rivers cross state borders. A branch of the Murray River, near Howlong, New South Wales. Although the Murray River forms much of the border separating New South Wales and Victoria, it is not Victoria's longest river because the New South Wales border is delineated by the river's southern bank rather than by the middle of the river. The only section of the river formally within Victoria is a stretch of approximately 11 kilometres (7 mi) where it separates Victoria and South Australia. At this point, the middle of the river forms the border. 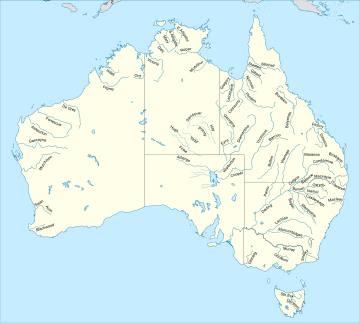 The following is a list of rivers located within Australian states and territories. Where a river crosses a state or territory boundary, it is listed in both states and territories. Where a river has a name that includes the word creek, it has been officially designated as a river. The Geographical Names Board of New South Wales lists 439 rivers in the Geographical Names Register. In the following list, where there are duplicated names, the source local government area (LGA) is identified. In the event of there being two rivers of the same name within the same local government area, additional referencing is provided. Rivers of New South Wales lists all rivers below, grouped according to whether the river flows towards the coast or flow inland, and grouped according to their respective catchment and sub-catchment. Where shown in italics, the watercourse is a creek, rivulet, brook, or similar. 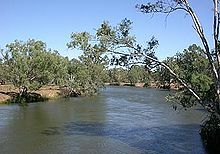 ^ "(Australia's) Longest Rivers". Geoscience Australia. 18 November 2010. Retrieved 31 May 2011. ^ a b "Longest rivers". Geoscience Australia. Australian Government. 21 December 2012. Retrieved 15 June 2013. ^ "List of placenames ASSIGNED as RIVERs". Geographical Names Register (GNR) of NSW. Geographical Names Board of New South Wales. Archived from the original on 16 November 2010. Retrieved 30 May 2008. ^ "Peel River (A Section Of)". Geographical Names Register (GNR) of NSW. Geographical Names Board of New South Wales. Retrieved 17 December 2008. ^ "Peel River". Geographical Names Register (GNR) of NSW. Geographical Names Board of New South Wales. Retrieved 17 December 2008. ^ "Douglas River / Daly River Esplanade Conservation Area". Northern Territory Department of Natural Resources, Environment and The Arts. Retrieved 18 May 2008. ^ "Latest Weather Observations for Douglas River". Bureau of Meteorology. Retrieved 18 May 2008. ^ "A remote fully guided barramundi fishing lodge 30 minutes from Darwin". Melville Island Lodge. Archived from the original on 20 February 2008. Retrieved 18 May 2008. ^ "New Bridge Over The Palmer River". Northern Territory Government. 21 April 2006. Retrieved 18 May 2008. ^ "Search Results – Wildman River". Australian Natural Resources Atlas. Department of the Environment, Water, Heritage and the Arts (Australia). Retrieved 18 May 2008. ^ a b "Surface Water Management Area: Bowen / Broken". Australian Natural Resources Atlas. Department of the Environment, Water, Heritage and the Arts (Australia). Retrieved 18 May 2008. ^ "Bowen River". Water management. Department of Natural Resources and Water. 16 November 2007. Retrieved 18 May 2008. ^ "Dee River". Water management. Department of Natural Resources and Water. 16 November 2007. Retrieved 18 May 2008. ^ "Jardine River National Park, Heathlands and Jardine River Resources Reserves". The State of Queensland (Environmental Protection Agency). Archived from the original on 9 November 2007. Retrieved 18 May 2008. ^ "Diamantina River". Diamantina Shire Council. Archived from the original on 19 July 2008. Retrieved 30 May 2008. ^ "Fortesque River at Roy Hill Station, 1926". National Library of Australia. Archived from the original on 5 August 2009. Retrieved 23 July 2008.